Simone Stumpf received a PhD in Computer Science in 2001 and a BSc in Computer Science with Cognitive Science in 1996, both from University College London. She joined City University London as Lecturer in 2009. Previously, she worked at Oregon State University (USA) and University College London as a Research Fellow/Manager. Simone also has industrial experience as a User Experience Architect. 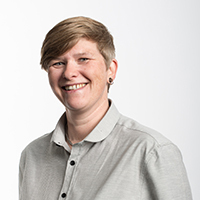 Dr Simone Stumpf's core research focus has been on the use of intelligent systems by end users, end-user programming and information management systems. At University College London (UCL) she was involved in a large-scale user trial of biometric security systems and contributed to an EPSRC-funded project to design and implement a system used by security staff to detect and prevent theft by employees. At Oregon State University, she worked on the TaskTracer project (as part of the CALO research project) to develop an intelligent user interface system, targeted at information workers, that combined the automatic tracking of users' information resources and the application of machine learning to enable activity-based personal information management. More recently, she has focused extensively on end-user interactions with systems that use machine learning algorithms. She has investigated explanations of machine learning systems and the effects that explanations have on end users' understanding and ability to control these novel AI systems. End-user programming/development, Intelligent User Interfaces, Personal Information Management. - Co-Investigator, Self-Care Advice, Monitoring, Planning and Intervention (SCAMPI), EPSRC. Barbosa, S., Markopoulos, P., Paternò, F., Stumpf, S. and Valtolina, S. (2017). Preface. ISBN 978-3-319-58734-9. Pietriga, E., Luyten, K., Jansen, Y., Nichols, J., Stumpf, S., Calvary, G. … Di Fiore, F. (2018). Foreword. ISBN 978-1-4503-5897-2. Holliday, D., Wilson, S. and Stumpf, S. (2016). User trust in intelligent systems: A journey over time. In Nichols, J., Mahmud, J. and O'Donovan, J. (Eds. ), Proceedings of the 21st International Conference on Intelligent User Interfaces (pp. 164–168). New York, USA: ACM. ISBN 978-1-4503-4137-0. Ginon, B., Stumpf, S. and Jean-Daubias, S. (2016). Towards the right assistance at the right time for using complex interfaces. In Buono, P., Lanzilotti, R. and Matera, M. (Eds. ), International Working Conference on Advanced Visual Interfaces (pp. 240–243). New York, USA: ACM. ISBN 978-1-4503-4131-8. Wong, W.K., Oberst, I., Das, S., Moore, T., Stumpf, S., McIntosh, K. … Burnett, M. (2011). End-user feature labeling via locally weighted logistic regression. PROCEEDINGS OF THE TWENTY-FIFTH AAAI CONFERENCE ON ARTIFICIAL INTELLIGENCE (pp. 1575–1578). ISBN 978-1-57735-509-0. Kulesza, T., Wong, W.K., Stumpf, S., Perona, S., White, R., Burnett, M.M. … Ko, A.J. (2009). Fixing the program my computer learned: Barriers for end users, challenges for the machine. In Conati, C. and Bauer, M. (Eds. ), Proceedings of the 14th international conference on Intelligent user interfaces (pp. 187–196). New York, USA: ACM. ISBN 978-1-60558-168-2. Crosswhite, J., Fox, J., Reed, C., Scaltsas, T. and Stumpf, S. (2004). Computational models of rhetorical argumentation. In Reed, D.C. and Norman, T.J. (Eds. ), Argumentation machines: new frontiers in argument and computation London: Springer Netherlands. ISBN 978-1-4020-1811-4. Stumpf, S. (2019). Horses for courses: Making the case for persuasive engagement in smart systems. Lim, B., Smith, A. and Stumpf, S. (2018). ExSS 2018: Workshop on explainable smart systems. Goebel, R., Chander, A., Holzinger, K., Lecue, F., Akata, Z., Stumpf, S. … Holzinger, A. (2018). Explainable AI: The new 42? Bourazeri, A. and Stumpf, S. (2018). Co-designing smart home technology with people with dementia or Parkinson's disease. Göker, A., Butterworth, R., MacFarlane, A. and Stumpf, S. (2017). Presenting and visualizing image results for professional image searchers: A field evaluation. Göker, A., Butterworth, R., MacFarlane, A. and Stumpf, S. (2017). Presenting and visualizing results on an image retrieval user interface. Skrebe, S. and Stumpf, S. (2017). An exploratory study to design constrained engagement in smart heating systems. Brown, D., Waugh, S., Bussone, A. and Stumpf, S. (2017). Evaluation of BeYou plus an mHealth application to support self-management strategies for people living with HIV. Bussone, A., Stumpf, S. and Buchanan, G. (2016). "It feels like I'm managing myself": HIV+ people tracking their personal health information. Kulesza, T., Burnett, M., Wong, W.K. and Stumpf, S. (2015). Principles of Explanatory Debugging to personalize interactive machine learning. Bussone, A., Stumpf, S. and O'Sullivan, D. (2015). The role of explanations on trust and reliance in clinical decision support systems. Sherwani, D. and Stumpf, S. (2014). Toward helping users in assessing the trustworthiness of user-generated reviews. Kulesza, T., Stumpf, S., Burnett, M., Yang, S., Kwan, I. and Wong, W.K. (2013). Too much, too little, or just right? Ways explanations impact end users' mental models. Holliday, D., Wilson, S. and Stumpf, S. (2013). The Effect of Explanations on Perceived Control and Behaviors in Intelligent Systems. Curran, W., Moore, T., Kulesza, T., Wong, W.K., Todorovic, S., Stumpf, S. … Burnett, M. (2012). Towards recognizing "cool": Can end users help computer vision recognize subjective attributes of objects in images? Kulesza, T., Stumpf, S., Burnett, M. and Kwan, I. (2012). Tell me more? the effects of mental model soundness on personalizing an intelligent agent. Loumakis, F., Stumpf, S. and Grayson, D. (2011). This image smells good: Effects of image information scent in search engine results pages. 20th ACM Conference on Information and Knowledge Management (CIKM) 24-28 October, Glasgow. Stumpf, S. and Muscroft, S. (2011). When users generate music playlists: When words leave off, music begins? Third International Workshop on Advances in Music Information Research (AdMIRe) in conjunction with the IEEE International Conference on Multimedia and Expo (ICME) 11-15 July, Barcelona. Wong, W.-.K., Oberst, I., Das, S., Moore, T., Stumpf, S., McIntosh, K. … Burnett, M.B. (2011). End-User Feature Labeling: A Locally-Weighted Regression Approach. Conference on Intelligent User Interfaces (IUI) 13-16 February, Palo Alto. Wong, W.-.K., Oberst, I., Das, S., Moore, T., Stumpf, S., McIntosh, K. … Burnett, M. (2011). End-user feature labeling: A locally-weighted regression approach. Kulesza, T., Burnett, M., Stumpf, S., Wong, W.K., Das, S., Groce, A. … McIntosh, K. (2011). Where are my intelligent assistant's mistakes? A systematic testing approach. Scaffidi, C., Burnett, M., Costabile, M.F., Stumpf, S. and Wulf, V. (2011). European-American collaboration workshop. Shinsel, A., Kulesza, T., Burnett, M., Curran, W., Groce, A., Stumpf, S. … Wong, W.K. (2011). Mini-crowdsourcing end-user assessment of intelligent assistants: A cost-benefit study. Loumakis, F., Stumpf, S. and Grayson, D. (2011). This image smells good: Effects of image information scent in search engine results pages. Kulesza, T., Stumpf, S., Burnett, M., Wong, W.-.K., Riche, Y., Moore, T. … McIntosh, K. (2010). Explanatory debugging: Supporting end-user debugging of machine-learned programs. Metoyer, R.A., Stumpf, S., Neumann, C., Dodge, J., Cao, J. and Schnabel, A. (2009). Explaining How to Play Real-Time Strategy Games. Twenty-ninth SGAI International Conference on Artificial Intelligence (AI-2009) 15-17 December, Cambridge. Shen, J., Irvine, J., Bao, X., Goodman, M., Kolibaba, S., Tran, A. … Dietterich, T.G. (2009). Detecting and correcting user activity switches: Algorithms and interfaces. Stumpf, S., Sullivan, E., Fitzhenry, E., Oberst, I., Wong, W.-.K. and Burnett, M. (2008). Integrating rich user feedback into intelligent user interfaces. Stumpf, S., Fitzhenry, E. and Dietterich, T.G. (2007). The Use of Provenance in Information Retrieval. Workshop on Principles of Provenance (PROPR) 19-20 November, Edinburgh. Stumpf, S., Burnett, M. and Dietterich, T. (2007). Improving intelligent assistants for desktop activities. Stumpf, S., Rajaram, V., Li, L., Burnett, M., Dietterich, T., Sullivan, E. … Herlocker, J. (2007). Toward harnessing user feedback for machine learning. Neumann, C., Schnabel, A., Dodge, J., Metoyer, R.A. and Stumpf, S. (2007). How experts explain strategic behavior during real-time strategy games. Stumpf, S., Burnett, M.M. and Dietterich, T.G. (2007). Improving Intelligent Assistants for Desktop Activities. Stumpf, S. and Herlocker, J. (2006). TaskTracer: Enhancing Personal Information Management Through Machine Learning. PIM Workshop, SIGIR 10-11 August, Seattle. Fitzhenry, E., Herlocker, J. and Stumpf, S. (2006). Supporting the Use and Authoring of Digital Physics Textbooks. Thinking Through New Media 6-8 June, Durham. Kissinger, C., Burnett, M., Stumpf, S., Subrahmaniyan, N., Beckwith, L., Yang, S. … Rosson, M.B. (2006). Supporting end-user debugging: What do users want to know? Lettkeman, A.T., Stumpf, S., Irvine, J. and Herlocker, J. (2006). Predicting task-specific webpages for revisiting. Burnett, M., Herlocker, J., Lynn, J., Stumpf, S. and Wynn, E. (2005). TaskTracer: Using Machine Learning to Simplify Multi-tasking. Intel Information Systems and Technology Group, Technical Community Conference 24-26 October, Lake Tahoe2. Stumpf, S., Bao, X., Dragunov, A., Dietterich, T.G., Herlocker, J., Johnsrude, K. … Shen, J.Q. (2005). Predicting user tasks: I know what you're doing! Stumpf, S., Bao, X., Dragunov, A., Dietterich, T.G., Herlocker, J., Johnsrude, K. … Shen, J.Q. (2005). The TaskTracer system. Stumpf, S. and McDonnell, J. (2004). Sharing metadata - Problems and potential solutions. Stumpf, S. and McDonnell, J. (2003). Using repertory grids to test data quality and experts’ hunches. Workshop on Theory and Applications of Knowledge Management (TAKMA) 1-5 September, Prague. Stumpf, S. and McDonnell, J. (2003). Data, Information and Knowledge Quality in Retail Security Decision Making. 3rd International Conference on Knowledge Management (IKNOW’03) 2-4 July, Graz. Stumpf, S. and McDonnell, J. (2002). Is there an argument for this audience? 5th Conference of the International Society for the Study of Argumentation (ISSA) 25-28 June, Amsterdam. Stumpf, S. and McDonnell, J. (2002). Taking off the blinkers and creating knowledge: decision support for retail security specialists. 7th International Psychology and Crime Investigation Conference 12-14 June, Liverpool. Stumpf, S. and McDonnell, J.T. (2001). Individual learning styles and perceptions of experiential learning in design teams. Proceedings 5th International Design Thinking Research Symposium "Designing in Context" (DTRS2001) 18-20 December, Delft. Stumpf, S. and McDonnell, J.T. (2000). A representation of rhetorical construction of understanding in teams during early design episodes. CoDesigning 2000 11-13 September, Coventry. Stumpf, S. and McDonnell, J.T. (1999). Relating argument to design problem framing. Proceedings 4th International Design Thinking Research Symposium (DTRS99) 23-25 April, Cambridge, MA. Shinsel, A., Kulesza, T., Burnett, M., Curran, W., Groce, A., Stumpf, S. … Wong, W.-.K. Mini-Crowdsourcing End-User Assessment of Intelligent Assistants: A Cost-Benefit Study. Stumpf, S., Skrebe, S., Aymer, G. and Hobson, J. (2018). Explaining smart heating systems to discourage fiddling with optimized behavior. CEUR Workshop Proceedings, 2068. Frankowska-Takhari, S., MacFarlane, A., Goker, A. and Stumpf, S. (2017). Selecting and tailoring of images for visual impact in online journalism. INFORMATION RESEARCH-AN INTERNATIONAL ELECTRONIC JOURNAL, 22(1). Burnett, M., Stumpf, S., Makri, S., Macbeth, J., Beckwith, L., Kwan, I. … Jernigan, W. (2016). GenderMag: A Method for Evaluating Software’s Gender Inclusiveness. Interacting with Computers. doi:10.1093/iwc/iwv046 . Göker, A., Butterworth, R., MacFarlane, A., Ahmed, T.S. and Stumpf, S. (2016). Expeditions through image jungles: The commercial use of image libraries in an online environment. Journal of Documentation, 72(1), pp. 5–23. doi:10.1108/JD-01-2014-0019 . Groce, A., Kulesza, T., Zhang, C., Shamasunder, S., Burnett, M., Wong, W.K. … McIntosh, K. (2014). You are the only possible oracle: Effective test selection for end users of interactive machine learning systems. IEEE Transactions on Software Engineering, 40(3), pp. 307–323. doi:10.1109/TSE.2013.59 . Mera, M. and Stumpf, S. (2014). Eye-tracking Film Music. Music and the Moving Image, 7(3), pp. 3–23. Das, S., Moore, T., Wong, W.K., Stumpf, S., Oberst, I., McIntosh, K. … Burnett, M. (2013). End-user feature labeling: Supervised and semi-supervised approaches based on locally-weighted logistic regression. Artificial Intelligence, 204, pp. 56–74. doi:10.1016/j.artint.2013.08.003 . Kulesza, T., Stumpf, S., Wong, W.-.K., Burnett, M., Perona, S., Ko, A. … Oberst, I. (2011). Why-Oriented End-User Debugging of Naïve Bayes Text Classification. Transactions on Interactive Intelligent Systems, 1(1). Kulesza, T., Stumpf, S., Wong, W.K., Burnett, M.M., Perona, S., Ko, A. … Oberst, I. (2011). Why-oriented end-user debugging of naive Bayes text classification. Transactions on Interactive Intelligent Systems, 1(1). doi:10.1145/2030365.2030367 . Kulesza, T., Stumpf, S., Wong, W.K., Burnett, M.M., Perona, S., Ko, A. … Oberst, I. (2011). Why-oriented end-user debugging of naive Bayes text classification. ACM Transactions on Interactive Intelligent Systems, 1(1). doi:10.1145/2030365.2030367 . Metoyer, R., Stumpf, S., Neumann, C., Dodge, J., Cao, J. and Schnabel, A. (2010). Explaining how to play real-time strategy games. Knowledge-Based Systems, 23(4), pp. 295–301. doi:10.1016/j.knosys.2009.11.006 . Stumpf, S., Rajaram, V., Li, L., Wong, W.-.K., Burnett, M., Dietterich, T. … Herlocker, J. (2009). Interacting meaningfully with machine learning systems: Three experiments. International Journal of Human Computer Studies, 67(8), pp. 639–662. doi:10.1016/j.ijhcs.2009.03.004 . Stumpf, S. and McDonnell, J. (2004). An investigation into sharing metadata: "I'm not thinking what you are thinking". Journal of Universal Computer Science, 10(6), pp. 740–748. doi:10.3217/jucs-010-06-0740 . Stumpf, S.C. and McDonnell, J.T. (2002). Talking about team framing: Using argumentation to analyse and support experiential learning in early design episodes. Design Studies, 23(1), pp. 5–23. doi:10.1016/S0142-694X(01)00020-5 . Tags and Structure in Recommendations. London, UK: Centre for Human Computer Interaction Design, City University London. Stumpf, S., Burnett, M., Pipek, V. and Wong, W.-.K. (2012). End-user interactions with intelligent and autonomous systems. ACM. ISBN 978-1-4503-1016-1. Seifert, E., Stumpf, S., Herlocker, J. and Wynn, E. (2008). Browsing for information on the web and in the file system. School of Electrical Engineering and Computer Science, Oregon State University. Stumpf, S. and Sasse, A. (2005). BioPII Akzeptanzstudie Abschlussbericht..
Stumpf, S. (1998). Between a rock and a hard place: argumentation theory between rationalistic and interpretivist standpoints. Computer Science Department, University College London. Stumpf, S. (1997). Argumentation-based design rationale - the sharpest tools in the box. Computer Science Department, University College London. Stumpf, S., Burnett, M., Rajaram, V. and Herlocker, J. Supporting knowledge workers in practice: how do they understand and use work units? School of Electrical Engineering and Computer Science, Oregon State University. Rajaram, V., Stumpf, S., Burnett, M., Dragunov, A., Wick, E., Lynn, J. … Herlocker, J. Getting to the information you already have. School of Electrical Engineering and Computer Science, Oregon State University. Stumpf, S., Burnett, M., Dietterich, T.G., Johnsrude, K. and Herlocker, J. Recovery from Interruptions: Knowledge Workers’ Strategies, Failures and Envisioned Solutions. School of Electrical Engineering and Computer Science, Oregon State University. On sabbatical from 1 September 2018! - Lead Delivery Partner, Capital Accelerate & Scale Tech Superstars (CASTS), EU ERDF.